Globalinx provides the Subsea Cable Operators dedicated Cable Landing Station (CLS) to host their Power Feed Equipment (PFE) and Submarine Line Terminal Equipment (SLTE), thereby facilitate the transition from wet-plant to dry-plant in our secure colocation hotel. Additionally, the density of terrestrial fiber providers at Globalinx, will enable subsea cable operators to handoff the subsea fiber capacity to terrestrial fiber Globalinx is developing a Subsea Carrier-Neutral Hotel in Virginia Beach to enable interconnectivity. The new Subsea Cables MAREA and BRUSA present a very unique value proposition for the City of Virginia Beach connecting it directly to Bilbao, Spain (through MAREA) and to San Juan, Puerto Rico; Fortaleza and Rio de Janeiro, Brazil (through BRUSA). This effectively makes Virginia Beach the interconnection point for three continents. The interconnections or the NNIs (Network-to-Network Interconnections) usually take place in a carrier-hotel where there is reliable colocation space, abundant power (AC and DC), and scalable Cross Connects available. The colocation space and power is used by network providers, content distribution companies, Cloud providers, MSOs (Multiple-system operators) or cable companies to house their networking equipment and interconnect with each other, and to connect Virginia Beach to other parts of the Eastern seaboard. These interconnection takes place in a specialized telecommunications room called a “Meet-Me-Room”. Enterprises also colocate their services in a carrier-neutral colocation provider to have the ability to have low-latency direct connections to multiple carriers. Globalinx’s Subsea Carrier-Neutral Hotel in Virginia Beach is poised to transform Virginia Beach in to a connectivity hub of mid-Atlantic. 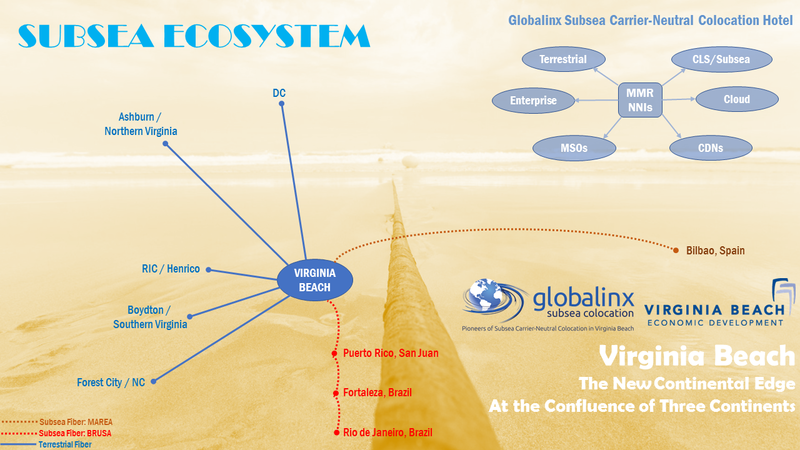 Globalinx offers network providers and enterprises to establish a presence in a reliable secure colocation environment and connect to both terrestrial networks and to subsea networks available in Virginia Beach. Further, Virginia Beach offers subsea operators a completely diverse option to NY-NJ region. Virginia Beach is the new Continental Edge of the mid-Atlantic region in the Eastern seaboard of the United States. Copyright © 2019 Globalinx Subsea Colocation. All Rights Reserved.